Diana always admired the Georgian/Colonial-style home on Beverly Court when she drove from Downtown to Spring Hill on Old Shell Road, visiting then-boyfriend Blair. 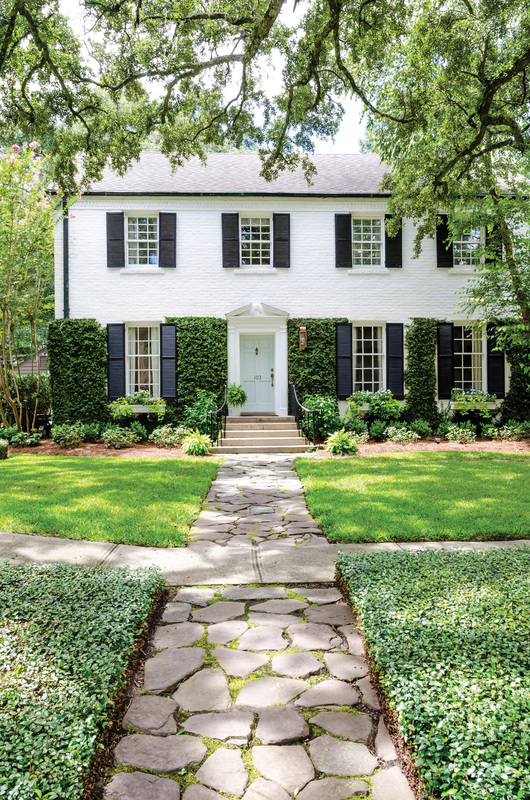 “I loved the clean-lined symmetry of the Georgian/Colonial-style architecture, and the fig vine growing up the brick added so much character,” Diana says. When the home went on the market around the time the couple got engaged, it was the obvious choice. “We might have gone to an open house or two, but we didn’t look seriously at any other house,” Blair, a business litigation attorney at McDowell, Knight, Roedder and Sledge, LLC, recalls. “It was a size we could grow into and in the right part of town for us.” And grow into the house they have. 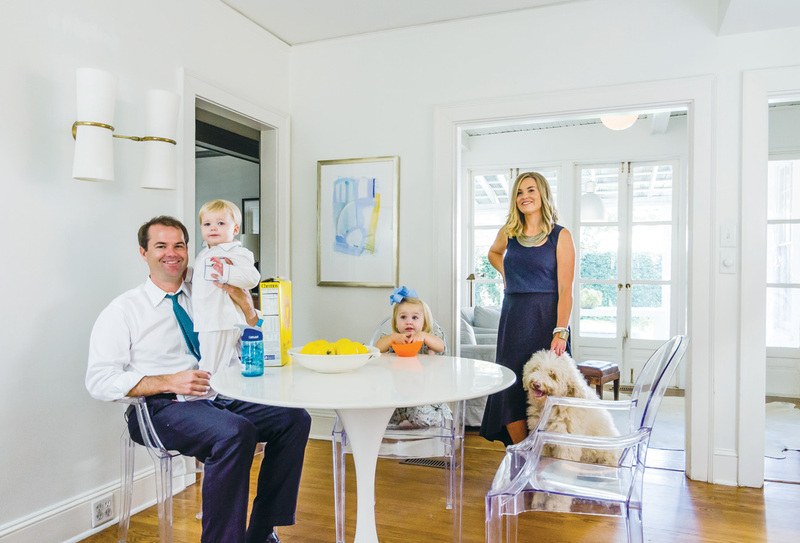 The home is now full with daughter Eleanor, 3; son James, 2; and goldendoodle Winnie, 5. The Newmans swapped the former red front door for “Palladian Blue” by Benjamin Moore. Diana loves to garden and added window boxes now filled with impatiens, marigolds, ivy and sweet potato vine. They cleaned up existing landscaping using boxwoods, hydrangeas, gardenias, ferns and jasmine. The couple got to work making the home theirs by painting every room. They used “Alabaster” by Sherwin Williams throughout the main living area, breakfast area, kitchen and sunroom to create consistency and flow. “We also changed out every light fixture,” Diana adds. 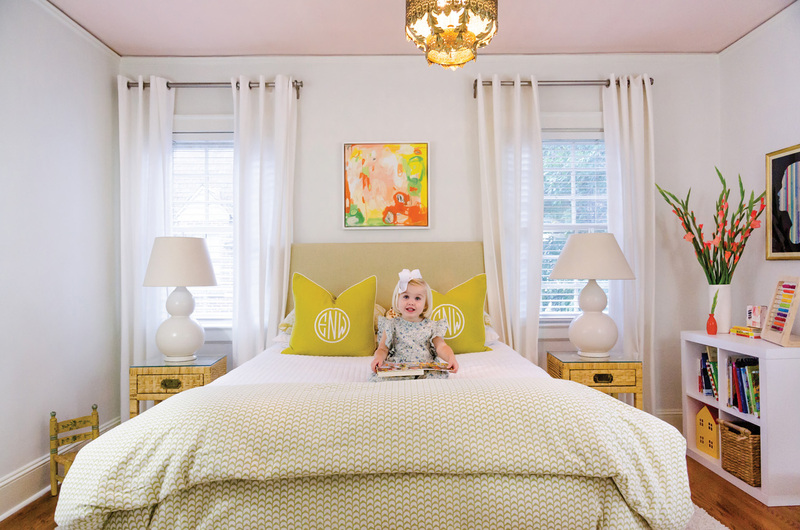 She believes in investing in good lighting because, much like paint colors, it can really change the room. 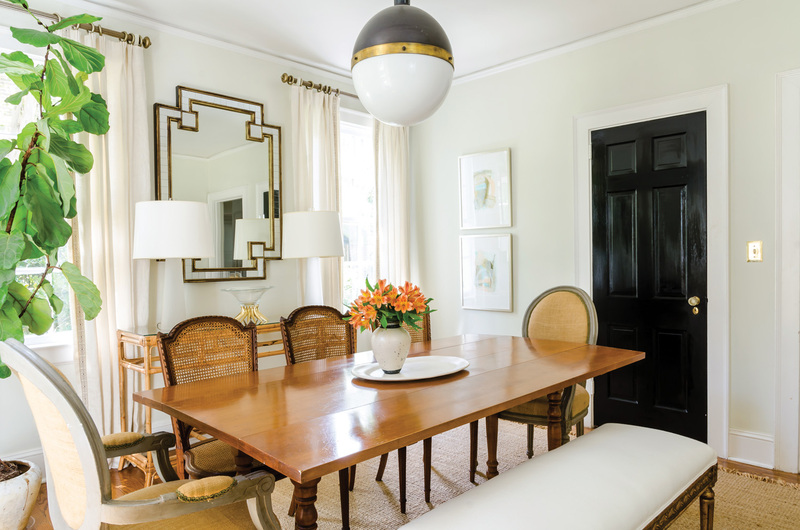 When it came to decorating, Diana wanted stately cohesion but with a livable and fun edge. 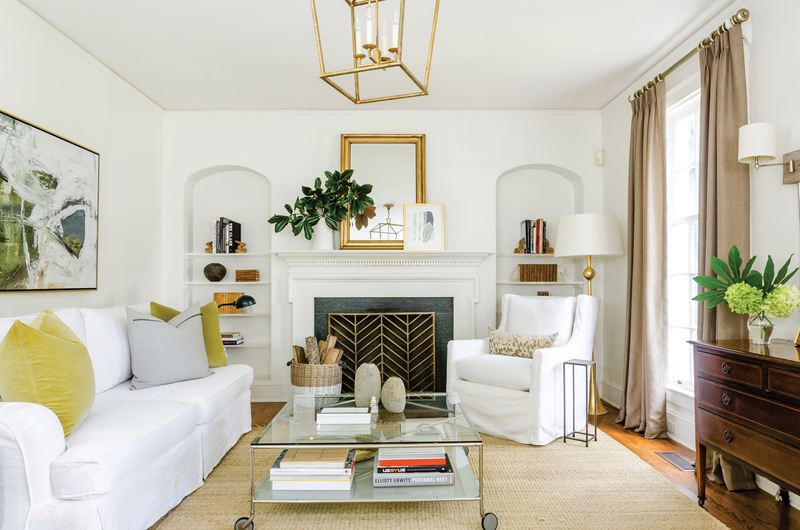 She likes a clean-lined, modern look but also likes incorporating vintage finds. The couple’s most prized possessions include their art and art-related items they’ve collected over years of travel. “One coffee table book I bought is of an art collection that was actually housed in a hotel we stayed in while in Nicaragua, and the first two pieces of art that we bought together were from our honeymoon in Croatia. They are still some of my favorites,” Diana says. When they aren’t working or at school, the family appreciates time together in the sunroom or backyard and on the back porch. Diana, who put so much work into the house, can then relax and revel in the revival of design that stays true to the good bones of the structure. A clean color palette keeps an eclectic mix from feeling haphazard. Blair’s grandmother’s table anchors a bench from M.A. Simons, three cane-back chairs from Antiques at the Loop and two burlap-covered armchairs from a flea market in Nashville. The console table was a Southeastern Salvage find. The lamps are from Marshalls, but Diana upgraded them with paper shades from Atchison Home and acrylic finials from Yellow House Antiques. The door got a glossy coat of black and the walls are “French Canvas” by Benjamin Moore. Diana incorporates fun (but serious!) 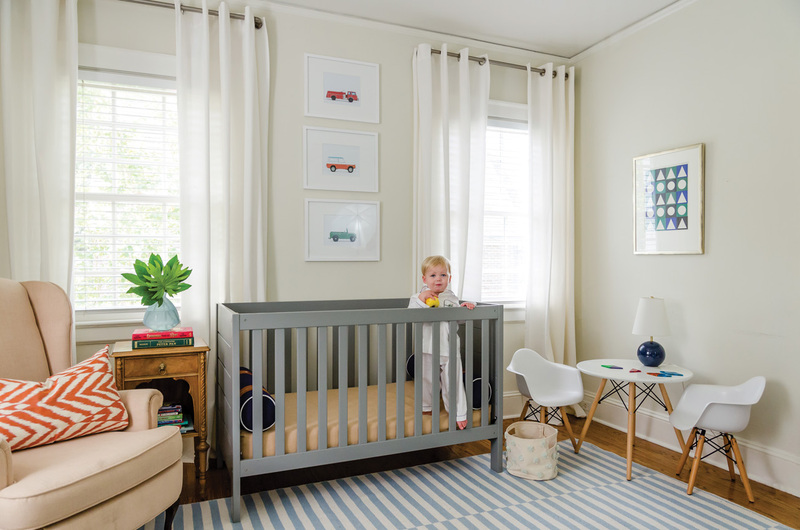 art into the kids’ rooms. Eleanor’s has a graphic, colorful silhouette found at the public library in Columbus, Mississippi. James’ playful photographs of matchbox toy cars and a fire truck are by Leslee Mitchell. A serigraph with blue, green and black shapes is by artist Victor Rosado. 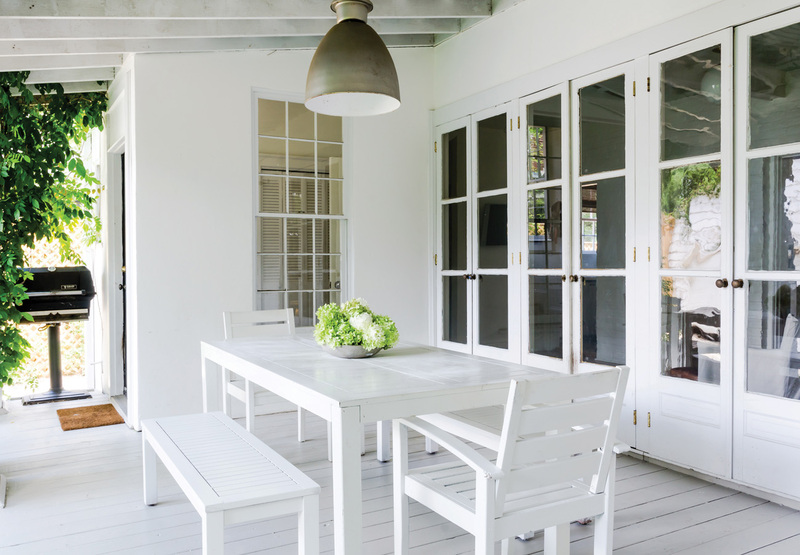 The sunroom has a wall of French doors leading out to the covered patio that looks onto a trellised wall of Confederate Jasmine. 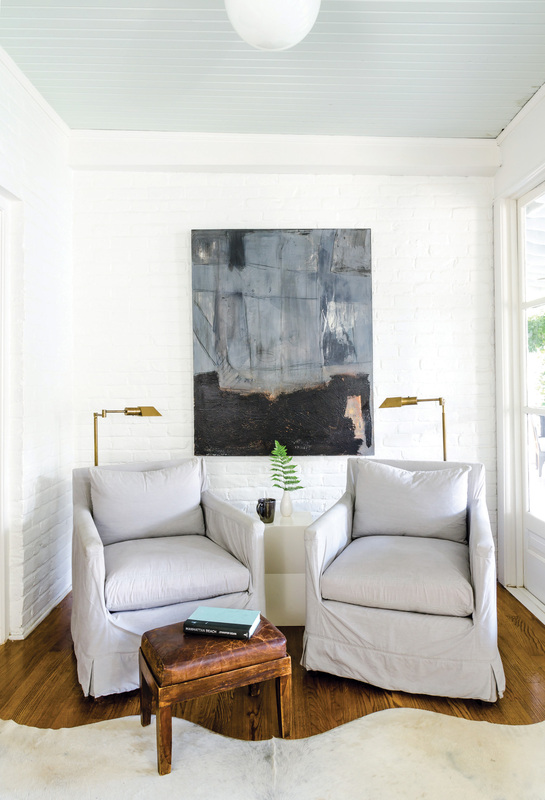 Above a pair of Lee Industries chairs from Atchison Home hangs a statement piece of art from High Cotton Consignments. Diana found The pair of library reading lamps at Yellow House Antiques. The side table is West Elm and the footstool and cowhide were Nashville antique mall scores.